Extreme stage fright can be a truly debilitating condition. Sometimes knowing that your thinking stinks is not enough to conquer it. "If someone would ask me to sing that day I would have no problem so long as I kept my mind busy till then. But, if as usual they scheduled it in advance, I would gradually get to the point the day or two before that I became incapacitated and would sadly have to cancel. I say, "sadly", because it got to be very depressing. When I was a young girl scheduled to sing in church, I'd get very sick like with the flu (with fever, no less) and remember even sneaking into a robe room to lie down on the floor, I was so weak. I didn't want to admit to anyone I was sick because they'd think it was an excuse and that I was scared. (LOL) But the diarrhea and heart palpitations/anxiety stopped me in my tracks. Fact is, I was terrified. But I loved to sing! I really, really loved to sing. I needed to sing. So, I learned that if I just would go on a fast for two or three days before the event, I'd have no problem with the diarrhea. Problem solved...NOT!" There is a book written by a minister who was in a terrible wreck in which he lost both legs and an arm. He describes that having died and passing through heaven's gates made of undulating, pearlescent, opaque organic matter, there was music. Individual pieces of music, alive and coming from every direction; not in harmony per se, yet indescribably beautiful together. Do some of us sense the impossibility of attaining that in human form. Is that it? Or are we just terrified of each other? Hopefully, Judy, you'll be able to help some brave souls to keep trying because we shouldn't fear sharing warmth from our deepest quarters even if those quarters aren't perfect." I have personally known people who try to anesthetize stage fright with substance abuse. Besides the health issues that come from this approach, there is also this: If the cocaine, alcohol or other substance momentarily does cause anxiety to abate and courage to artificially (and many times arrogantly) increase, you become terrified to sing, play or write WITHOUT the drink or drug. Then you, my friend, are most horribly hooked on a merry-go-round that will steal your life. Don't know about you, but even my own voice- as important as it is to me- is not worth that. "The prescription medicine most commonly used is a beta-blocker such as propranolol. It peaks within a few hours and slows the heart rate down along with decreasing a tremor. Also the SSRI antidepressants such ac paxil have been approved for "social anxiety" of which stage fright is a type. Theses are usually tolerated well in most healthy adults but, as in all medications, there are potential side effects that your doctor should go over with you." "...the use of beta-blockers provided the much-needed relief. Plus, he wrote that with more stage experience, increased acceptance of his level of skill, and by allowing his playing to become more fun he has not needed to use beta-blockers in years. A real success story!" 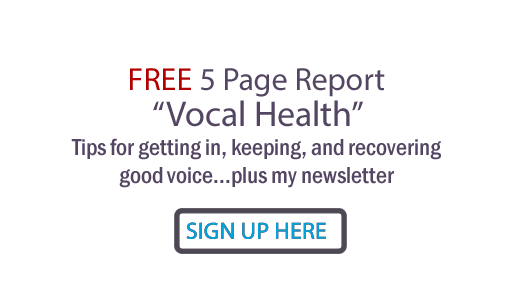 Power, Path & Performance associate teacher Kayla Morrison had such huge issues with stage fright they came with symptoms like vascular knots in her neck and vocal cords that were partially paralyzed. Oh yeah. Amazing what fear can do. She healed, and says that talking it out, not keeping it to herself, was a big part of the solution to overwhelming fear. Carly Simon and Barbara Streisand both have managed to conquer extreme stage fright and get back to the stage as a joyful experience. As for my sister Pam, she is singing, too. Last Christmas I sat at her grand piano playing Christmas tunes. She sat with me and then began to ... SING... inviting everyone else to come join us. Soon her daughter's boyfriend, a photojournalist, began FILMING us, and we all had a ball... including my sister! She says she can "do it in the moment... just not if there is scheduling involved", giving the brain too much time to build anxiety. There is an old (Chinese??) proverb that goes "A bird doesn't sing to be heard, it sings because it has a song". Perhaps that is what my sister now does, and perhaps I need to add other motivations for singing: "To express your heart with music, feel your own song, find the joy of joining with other voices". Performance doesn't have to be scheduled to be powerfully successful! The very act of singing can help in the healing of stage fright. Sound vibrations cause physical and biochemical changes in the brain. Just the music itself (humming, singing in nonsense syllables or languages you don't understand, etc) can have power to heal. Encourage, but don't MAKE people, especially children, sing! Making children perform can lead to deep seated stage fright. Just let them know their voices are important to you and to others, and then them sing as they feel the authentic urge to do so, of course given the appropriate opportunity. Also, teach them to listen and to affirm others' voices. This will help them believe in the importance and validity of their own voices. We should indeed "FEEL" something - Numbness does not communicate. Butterflies just add to the excitement of performance. But when the butterflies turn into battering rams, we need to talk to someone and find help. Keep vocal ability in perspective. There is an old man in our little Presbyterian congregation who is a recovering alchoholic. Every year, with fear and trembling, he sings a solo as his gift of gratitude to God for his healing. Technically, he has one of the worst voices I've ever heard. But when he sings, there are tears in the eyes of most everyone, including me, at the beauty of his communication. His performance is wildly successful, and we can't wait til next year when he does it again! Your comments are always welcome - if you want to comment publicly and add to the conversation, be sure to click the title, go to my blog on the web and find the comment link below this post, or just email me your permission along with your comment and I will do that for you. Thanks for the link Judy! My own experience is that the act of going through the performing over and over decreases the stage fright. I've known people who did beta-blockers - and they never seemed to move into a place where they really "got it." When you go through the nervousness - then you come out the other side and you get to feel that amazing feeling of being in the moment. Thank you, Christine. It's good to get personal experience feedback. Anybody else out there have experience with short or long term use of beta-blockers for stage fright? Great series of posts Judy. It will help a lot of people. Just an added note or two. Be sure you are evaluated by a health care provider before you take presciption medication. Although beta blockers are safe in most,if you have problems such as asthma or heart disease, even the beginning stages, the meds could cause serious side effects. Biofeedback, which gradually desensitizes you and helps you learn to relax, under the supervision of a certified person can help some with stage fright also. Thank you so much, Dr. Hubbard! Like your magazine, you share with us what possibilities medicine has to offer for this disorder, unless contraindicated. Your contribution to this discussion is much appreciated, and we hear your advice to consult our own medical professionals for wise treatment. Maybe you can speak to this in an article in your magazine some day? Hi- I found your site via James Hubbard's My Family Doctor. Public speaking has always been one that I avoid. I do not have a problem with speaking in front of others, I think it is the anticipation. So I just avoid it....I have work to do. Nice post! Thanks Mark.. .you are so right, the anticipation is the problem! Ignoring the anticipation so it doesn't build is a neat trick... and one I use myself!